One more son Soedirman obtain a very proud achievement at the national level, he is a GINANJARNJAR AGUNG student ISIP Department of Communication Science Faculty of Semester I. 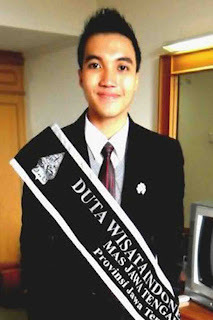 Elected Supreme INDONESIA TOURISM AMBASSADOR IN 2010 represents the province of Central Java. Indonesia Tourism Ambassador program is one of three programs be held by the Ministry of Culture and Tourism, two other programs that the selection of Miss Indonesia and Princess of Tourism. National level event selection Indonesian Tourism Ambassador in 2010 the Supreme facing competitors that are not arbitrary, because they, according to the Agung not only come from major universities in Indonesia, but also people who already hold the middle S2 and S3 was educated there is even a couple of professors. But the Court armed with experience and knowledge of tourism and local arts are able to defeat them and elect to be Ambassador TOURISM INDONESIA Year 2010. The material tested in the event that was held in Kendari from 1 till date December 6, 2010 consists of 3 areas include: Art Appreciation Adu Field Region, Division of Science and Attitudes. While the jury composed of Chairman Adwindo, Ministry of Tourism Representative, Ambassador to Malaysia, India Political Observer, Observer Dutch law, King Bali, Media Representatives, and Kak Zebby (save activist dragons). King Bali, obviously the Agung, even offering to lecture S2 level at one university in Bali and the cost will be borne entirely by Raja Bali.